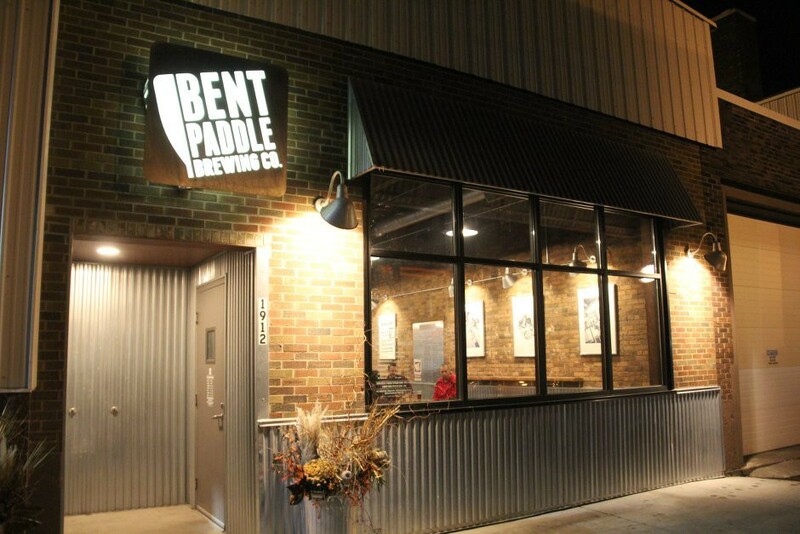 The second stop of our tour was the Bent Paddle Brewing Co. later that evening. 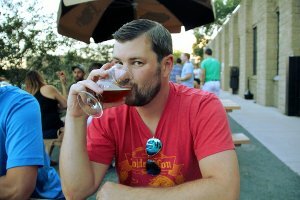 I’d had most of their beers at various tasting events and was really excited to try them direct from the source. 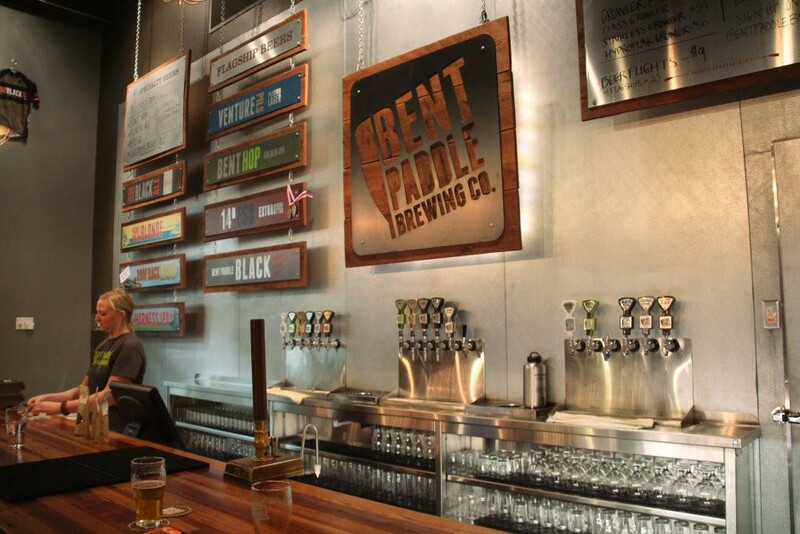 Bent Paddle opened in 2013 and is owned by two couples Colin & Laura Mullen and Karen & Bryon Tonnis. Byron and Colin do the brewing, Karen the operations, and Laura manages outreach and events. It all began with a chance meeting in 2010 at a charity event. From there it took a couple of years to get their business plan in place and begin their buildout. The origin of the name is after the paddle used by Byron to mix his mash while he worked at the Rock Bottom Brewery. It’s also a nod to the outdoors tradition so prevalent in northern Minnesota. The brewery is a little out of the way in an industrial area. 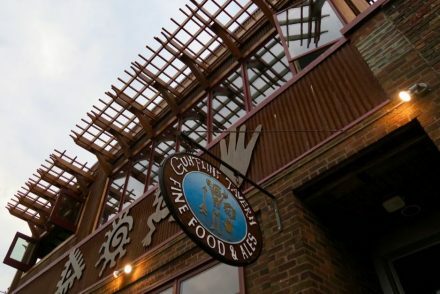 It was easily spotted due to the beautiful storefront with their logo lit up above the door. One thing that stands out to me about Bent Paddle is their branding. 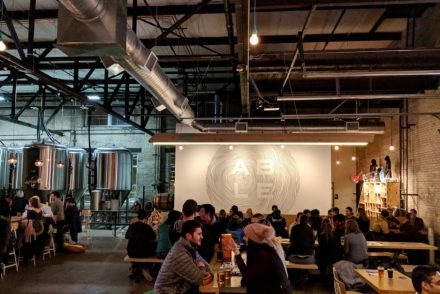 Their logo is excellent and they create imagery for each beer that is carried through the signage in the taproom all the way to the cans in the store. It seemed as if they even branded their seasonal beers that aren’t available in stores. This is a nice touch that I really enjoy. I loved the look of their taproom. It was a mixture of metal and wood that I like to describe as industrial chic. A clear garage door separates the brewery from the taproom so you can take a look at where your beer is born. 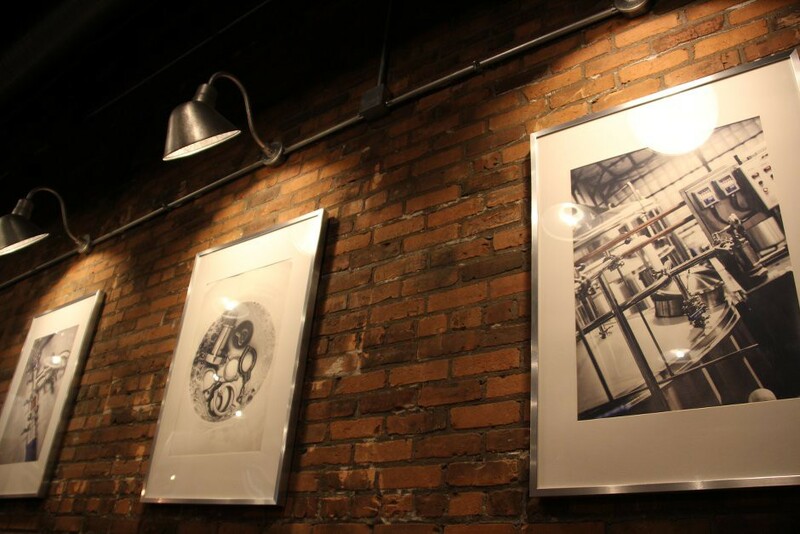 The photography on the walls was brewery themed and I wish they had prints available for purchase. They definitely had an attention to detail when putting this one together. It was a quiet intimate setting that I could see being a nice place to spend nights at if I were living in Duluth. If only this place was around when I was going to college! As I mentioned in my previous post I had forgotten my notebook so I wasn’t able to perform my usual tasting notes. I’ve had their beers several times and was able to remember some details from our visit after we returned to our hotel. 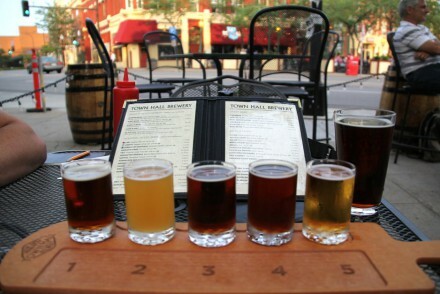 The flight was six total tasters, four of which were flagship and two seasonal. Three of them jumped out at me. The Harness IPA was bursting with flavor. It was dark amber with high alcohol content, and the hops gave it a great aroma. Their 14° ESB brought my back to the British Isles. This is a style of beer you don’t see much around here but that I really enjoy. It was a group favorite and a great representation of a bitter. I’d also recommend the Cold Press Black Ale, and if possible get it on nitro. It’s their normal Black Ale infused with cold press coffee from Duluth Coffee Company. These sort of mashups are really cool and great cross promotion for both companies and coincidentally results in a great beer. I’d had this one before at the Lakefront Days Tasting event so I knew what to expect, except this time I didn’t have any Tippy Cow to add to it! It was a great end to our first night on the north shore. 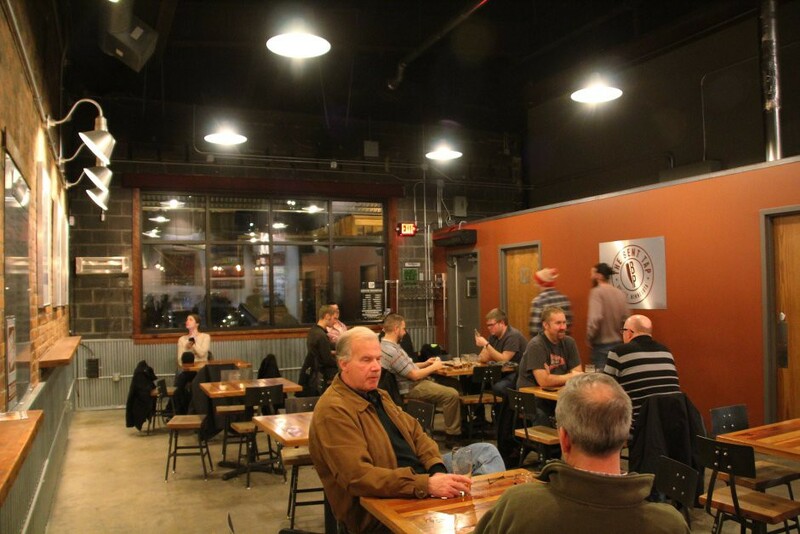 I would definitely visit again because the atmosphere is really what I look for in a taproom. 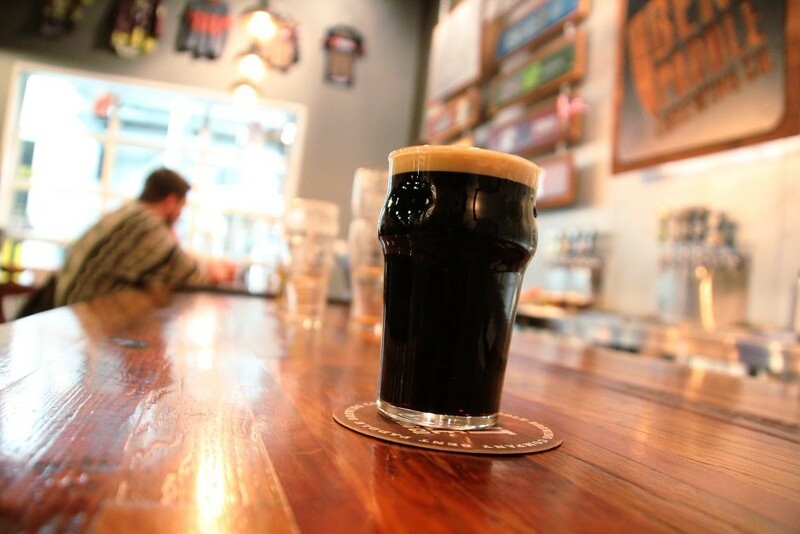 It’s got more of a quiet hangout feel than a bar or some of the busier taprooms in the metro. 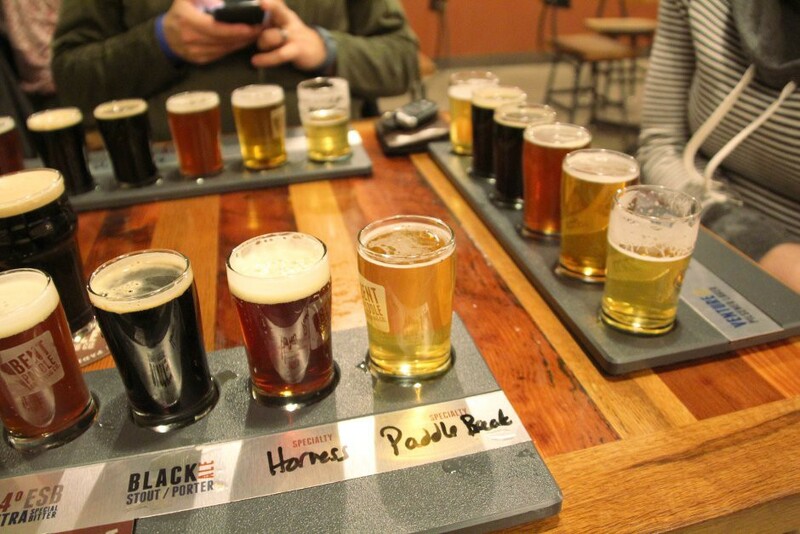 If you’re planning a trip to Duluth or just passing through make sure you include Bent Paddle on your itinerary.